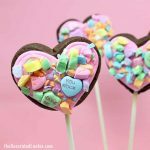 candy hearts: Kid-friendly chocolate candy hearts on sticks for Valentine's Day. I had to share with you one more Valentine’s Day treat I made for elsewhere. Red Tricycle asked me to come up with a kid-friendly sweets idea for the holiday. 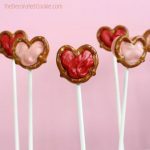 To test the kid-friendliness of these candy heart pops, I made them with my four-year old. I can assure you, Valentine’s Day candy hearts are kid-friendly indeed. These are so simple and easy to make, and take mere minutes. My daughter made these below all by herself! Seriously. All I did was melt the chocolate. She did the sticks and the piping and the sprinkles. I was across the room, even! I know what you’re thinking. GENIUS!! Thank you. Thank you very much. I love that Red Tricycle chose to include the photograph that shows both my heart pops and my daughter’s blobs and scribbles pops. 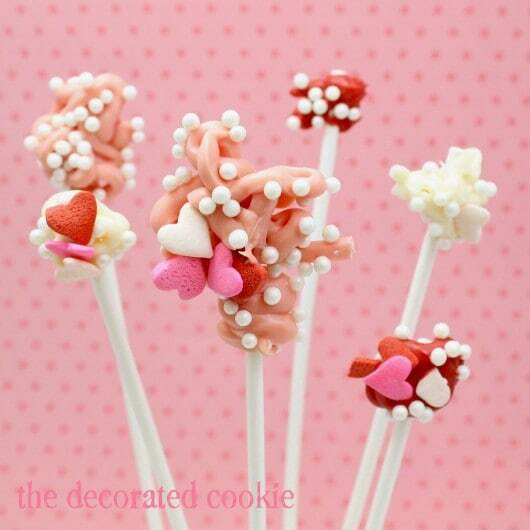 *Find the candy melts, sprinkles, decorating bags and lollipop sticks in the baking aisle of any major craft store. 1. Prepare the trays: Line baking tray(s) with sheets of wax paper. Pour some sprinkles or candies in bowls to have ready. 2. 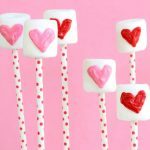 Melt the candy melts: Fill a disposable decorating bag with about ½ cup of candy melts. Microwave the bag at 50 percent power for 90 seconds. Massage the bag and continue to microwave in 30 second, then 15 second, intervals until completely melted, massaging at each interval. Do not overheat! Remove from the microwave, and close the opening tightly with a rubber band so the melts don’t ooze out the top when piping. 3. Make the candy pops: Snip ½-inch from the tip of the bag. Pipe a small dot the size of a dime on the wax paper. Lay the lollipop stick on top. This will help secure the lollipop stick to the back of the heart. 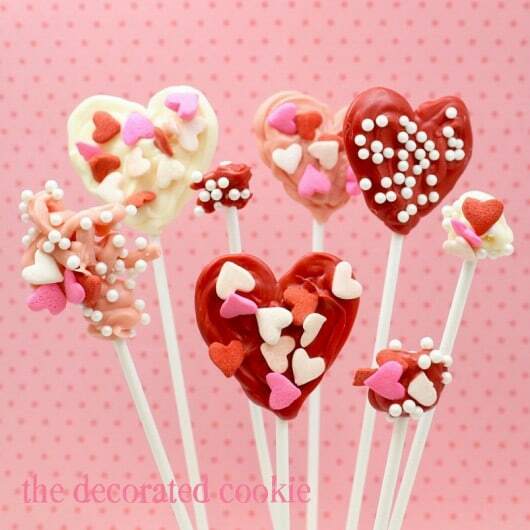 Then, pipe and fill a heart on top of the lollipop stick with the melted candy melts. Immediately add sprinkles or candies. 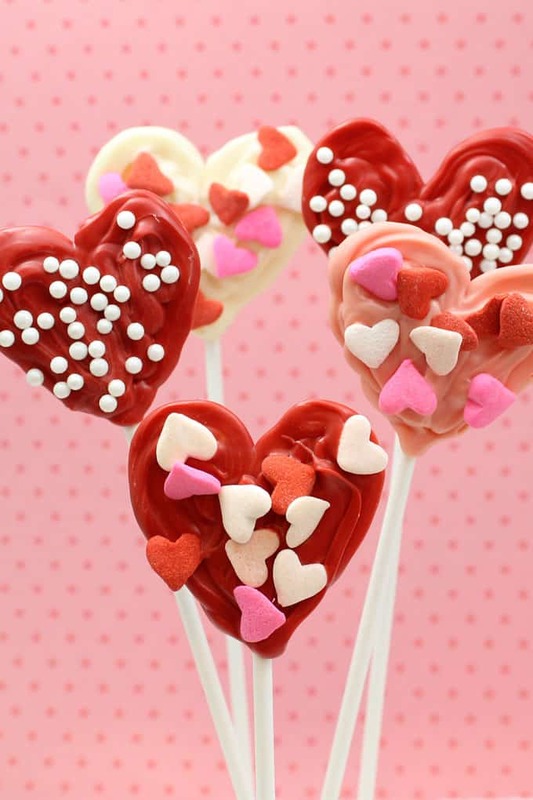 Candy melts harden quickly, so work with one heart pop at a time. Fill the tray and let set at room temperature very well, about one hour. — Create a template to help older kids pipe hearts. Draw a heart with black marker on a piece of paper, and slide under the wax paper. — Candy melts cool quickly, but they may be hot when first taken out of the microwave. Use caution when handling and let cool slightly before giving to children. — You may melt two to three bags of candy melts at the same time in the microwave to prevent squabbles over who gets to go first. 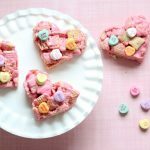 Can’t wait to try these sweet & CUTE treats with my grandbabies! Your daughter has a future in abstract art – I love them!! Too cute! It’s always great to have Kid Friendly ideas up your sleeve! Your little one is so creative, she is following your foot steps.